LiveControl currently features 6 pages, comprising of a Clip Launcher, Mixer, Device Controller, Step Sequencer, XY Pad and Track Controller. The Clip Launcher is a standard Ableton Live session view clip launcher. It allows you to easily launch and select clips as well as control some other settings in the Live Set. By default the navigation buttons will scroll in steps of 7 tracks and 7 scenes, however holding <Shift> and pressing the navigation buttons will let you move in steps of 1. The Device button allows you to switch between Device and Clip view for a specific track. LQ+/- allow you to change the launch quantisation options, and when <Shift> is held the record quantisation. Od lets you toggle overdub and Met the metronome. Tap allows you to tap tempo. Holding <Shift> and press Met or Tap allows you to adjust the tempo up or down in steps of 1bpm. Holding <Shift> and pressing a clip slot will focus that clip. The mixer page allows control over standard Ableton mixer functions such as the volume, panning, and send volumes for each track. Device control gives you control over 8 parameters at a time from the currently selected device. You can navigate the selected device using <Left>, <Right>, <Dev+> and <Dev->. <Bank+/-> scrolls through the devices parameters. The Seqeuencer page allows you to enter MIDI data into MIDI clips within the session view of Ableton Live. To use the Sequencer you must first select a MIDI clip in the Session View. Hold down <Menu 2> and press <Up>, <Down>, <Left> and <Right> to highlight a MIDI clip with the Selection Ring. Once you select a MIDI clip the sequencer should update with any MIDI data currently in the clip. Launch the clip and the LED’s should follow the playing position in the current clip. how do i change the “Clip Launcher” layout so that the name of the clips can be displayed in 2 rows? This is amazing, I’ve been having real fun with it…. ! Or perhaps a ‘standard’ 9 pad screen with two faders…. for reverb and delay…. I set this up using OSCulator but running the both is asking for trouble…. be great to include it… how would I do that? I can’t get ableton to give me an input/output option in the midi preferences even though I have live control showing up as a controller option – I’ve double checked everything in terms of how i installed – any tips? Why doesn't this work with previous live sets? Does it only work with new live sets? works with my previous livesets, i expect its a bug. If you enable debugging, start the logserver under the debug tab in livecontrol, then start live. Can you email me any errors you get in that window? is it possible to customize it for example i wanna put more details such as eqs and stuff in the launch section(put midi controlls)? because i wanna be ableto control EVERYTHING at the same time you know. sure you can add your own controls, if you want to move controls from other live pages make sure you copy the widget name exactly. i meant like, can you send midi message from touchosc while using this template? because somestuff i want to control using midi. how i can make the drum pads works with ableton live??? I will donate 50 usd for this amazing work. you need to tick “enable router”, then on the router page select a midi device and hit start router. See the installation page for documentation for the router. is something else already running on those ports, osculator or something? try starting LiveControl router before starting ableton Live. I think that to send midi you'll need to use the enable router option in live control… I'll play with it when I get home. Using the router option, you gain access to the drumpad/keys pages, and then you could create new pages in touchosc editor and add them in for a customer midi page, if I'm not mistaken. Can I edit this this template to add a button for the on/off Loop command?? 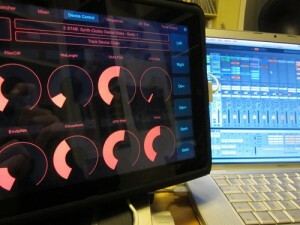 I already had touchOSC and I just bought Griid too….but you script is the best for sure…I only wish I had an iPad. still not clear some of the functions of some too small buttons…and the manual could be a bit more deep…but I happily donated 10 quids…and you deserve more. This is insane.. anybody figured out how to install the keys and drum pad? A good reason to buy an Ipad for sure, but I have a problem in showing the Midi Remote Surfaces > Livecontrol_To out of the ableton list, I have installed from the jar file and then copied the Livecontrol folder content into the installation folder…everything is working fine..just can’t find the Midi remote for it ; ) any tips? People keep talking about how I have to tick “enable router”… but I don’t see any box for it? help? Anybody knows how to fix “DRUMS AND KEYS” ? Where do you find ‘enable router’??? Anybody know the answer to this?? hi, I’m currently using a step sequencer script for a launchpad. it allows me to select a midi clip and then lock to that midi clip so that I can continue to select and work with other audio and midi clips in the set but the step sequencer will only input notes on the midi clip that I’ve locked to. is this possible to do with this software also ? it would be quite an inconvenience to have to keep reselecting the midi clip every time I wish to enter in a step sequence on it. where is the cross fader on the mixer page to go from A-B? where can i get the template? its not included in the download????? I think the template is missing from this page – can the developers post or can someone point us in right direction? Thank you for that great work! It’s possible to have more than 4 parameters (knobs) in the drum and keyboard page? I’ve searched every where to find the answer about the Pads and Keys not working on the Iphone. Here is the answer and fix that works for the IPad as well. Great tutorial! Quick and easy! Any idea how to do this on a mac? everytime i clos a live set, where i set up the 4 xy pads and pressed save, and i open it again, the xy pads are not assigned anymore! Any Help? Seems like the save/load buttons have no function?! I have a PC with windows 7 and I was able to get the template to trigger everything correctly. Is there a way to send the names of the clips being triggered and parameters being affected by the knobs? I find it really unusable without being able to know what I’m controlling. Where are the templates for the Android version? Amazing resource thank you!!! How do I get the XY pads on the software to move the XY pad in an instrument rack in Ableton Live? Thanks! The ipod template has navigation buttons and more stuff now. I have a generic chinese tablet with android 4.0.4 and this template works very very well. HI! i have a problem with XY Pads. They parameters doesn’t save, when i close the Ableton. How to save it?? Abandon hope all ye who enter here. There is no longer support for Ableton and TouchOSC. It does not work! I have same issue and have searched for days with no solution. Is the LiveControl template going to be updated for Ableton 9.1 ?? Finally fixed this. I used Wireshark to debug the packets going between my Win 7 64 box and my iPad. I could see the info being sent from Ableton…just wasn’t going to TouchOSC. The root cause was a bad DNS server. (thanks to Time Warner). A ping to my Win 7 box’s hostname (from my Win 7 box) was going to some external IP. (66.152.109.110…some hacker site in NY). I set my wireless router to use google DNS (8.8.8.8 / 8.8.4.4) and rebooted cable modem, router, Win 7 box and iPad. Also make sure you have bonjour installed. BTW..this is working with Live 9.1. One week of my life wasted on this…but I love a good mystery.